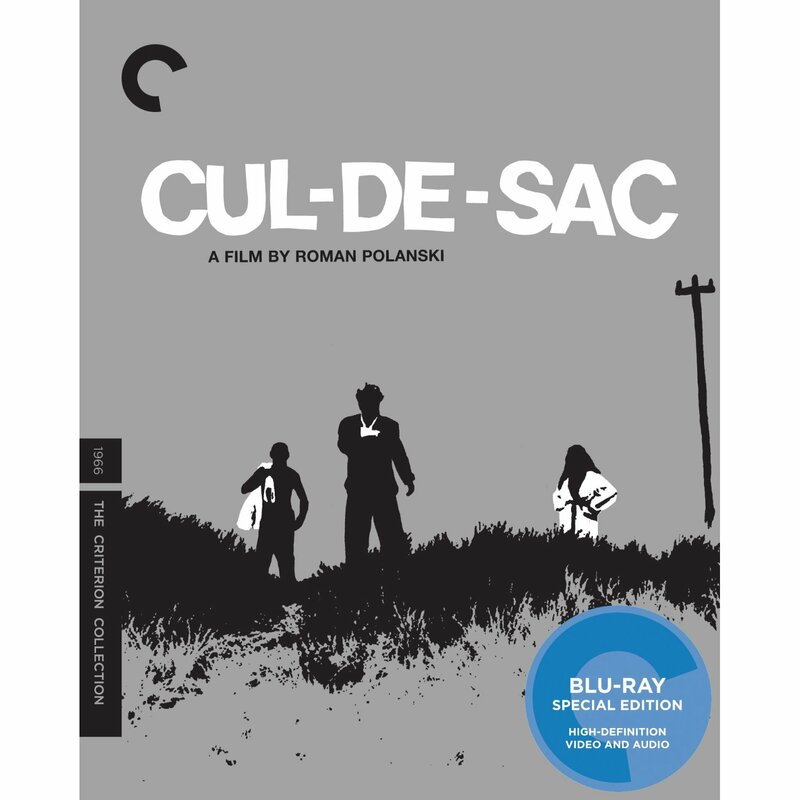 Criterion knocks it out of the park yet again with the release of Roman Polanski’s 1966 absurdly funny ‘Cul-De-Sac’. Before Polanski’s larger hits such as ‘Chinatown’ and ‘Rosemary’s Baby’, he made more of the experimental type film. This is where ‘Cul-De-Sac’ comes in. Throughout the film, you will see the film go from a seductive and sadistic thriller and slowly change into a twisted dark comedy. Truly a great little film from a fantastic director. And of course anything with Donald Pleasence is gold right? We first meet Dickie who is a gangster pushing his broken-down car with his criminal partner inside the car dying from a gun shot wound from a previous crime. The gangsters are cut of by rising water and their only escape is to a small island with a large house. 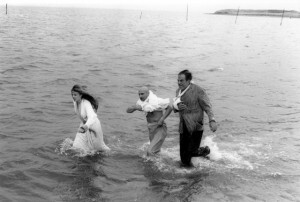 Once the gangsters arrive, they meet George (Donald Pleasence) and Teresa. Dickie then proceeds to hold the two hostage and completely screw with them emotionally and physically until his crime boss arrives with help. But it isn’t all thrills and tense moments. As I said before, it changes from a terrifying experience to an awkward comedy. Dickie starts to role-play with odd couple by pretending to be a butler and helping the couple. It is really funny. 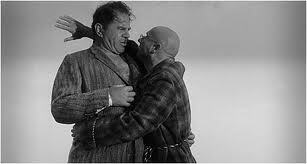 As for George, he is trying to be a gentleman, but his temper is boiling fast and ultimately comes to a hilarious but tense break down. I love how Polanski used the 60’s stereo typical cultures and showed us how they clashed with the gruff and mean American, the bumbling gentle Englishman, and the snobby French lady. It was hilarious to see that. This is an amazing little film that switches genres throughout the film and it plays very well. I love seeing a Polanski comedy. You will too. Must own and must see. The video is presented in a 1.66:1 1080p transfer and looks great considering the original source. I don’t think the video of ‘Cul-De-Sac’ is as good as some of the other B/W Criterion releases, but it still stand out and is the best print available. The image at times looks flat with some blemishes here and there. But, this is the best this film has ever looked and you will be satisfied. The audio has an uncompressed mono mix that sounds phenomenal. Full range of tone and no distortion. The dialogue is clear even though the actors volume levels go up and down do to some rambling and mumbling from the actors, but this was intentional to keep the awkward feel of the film. – Two Gangsters and an Island – A half hour or so 2003 documentary about the making of ‘Cul-De-Sac’ with the producers, director of Photography, and Polanski himself talking about the film and how they made it. This was a great treat. Loved watching this. Very insightful and a lot of fun. – 1967 Television Interview With Polanski – A half hour or so television interview with Polanski telling the BBC about his life and career in film. Absolutely a must see for any film fan or fan of Polanski. – Theatrical Trailers – A couple of trailers. Before Polanski became known around the world, he made ‘Cul-De-Sac’. Criterion did an amazing job with this release. It looks and sounds amazing. It was like watching the film for the first time all over again. The extras were great and informative. I highly recommend this movie. I love how Polanski switched genres throughout the film with such grace and ease and still made it awkward and entertaining. Loved it. See it. Purchase it. Purchase ‘Cul-De-Sac’ directly from Criterion HERE!!! Purchase ‘Cul-De-Sac’ from Amazon below!! This entry was posted on Tuesday, August 23rd, 2011 at 5:14 pm	and is filed under Film, News. You can follow any responses to this entry through the RSS 2.0 feed. You can skip to the end and leave a response. Pinging is currently not allowed.